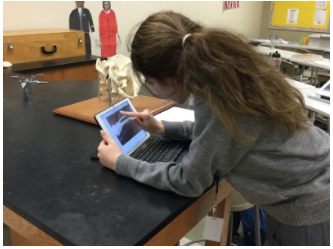 This is the fifth in a series of blog “snapshots” of how Mercy students benefit from using iPad technology (and other tools) throughout the school day. As I began thinking about how I would like to approach exam review with students, I wanted to focus on student participation. Exam review can sometimes turn into the teacher doing all of the work in review of the semester’s content. As I researched best practices for review I encountered this post: https://www.pinterest.com/pin/163959242663522710/ featuring the use of the Charades App for review. I was excited to try this as I knew of the app and game, I also knew students loved to play. Many already had this app on their iPad or phone. I shared with the Bio teachers. Most used this approach for some of the Bio review. Small groups could be assigned semester topics. These groups can evaluate the topic and decide on key points for focus, developing a Charades review to share with other groups. Small student groups can meet with each other and take turns playing their review games. Another approach has the teacher develop the terms for review to share with the class. Small groups meet to play. Either way, student must understand topics in order to describe the terms (without using the term) to their classmates. This encourages them to find different ways to explain semester topics to various students. This made exam review a little more social and fun. Teachers could visit with small groups and review/reinforce content as needed. Lab work often involves the use of specimens and investigation of specimens under the microscope. The iPads and phones have proved to be a useful tool in helping students create study guides to help them prepare for lab practicals and take pictures using the microscopes. The pictures students take are a huge improvement over pencil and paper drawings of the past. Students take pictures of tissues they are identifying under the microscope. As teachers assess their pictures and labeling of pictures, they can be sure students are identifying specimens correctly. 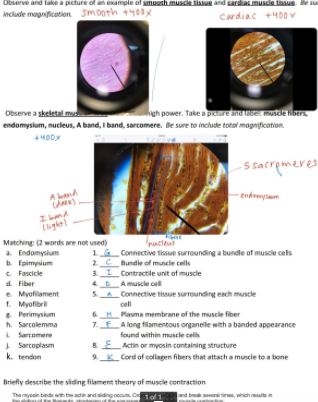 It is easier to explain tissues and identify structures while pointing to a picture taken by the student rather than trying to huddle into the same ocular lens of a microscope. This was sometimes a challenge with paper and pencil and we were never quite sure if students were simply drawing the images from lab guides or actually identifying the tissues on their own. Students take pictures of items in lab to look at and study later. Students can also take these pictures and add notes and drawing to them to help connect ideas. We also use the camera function to take pictures of magnified views of different specimens under the microscope. Although an iPhone is much easier to focus due to its size, the pictures can easily be transferred via airdrop to the iPad and inserted into an assignment. They can then be labeled if the student needs to. 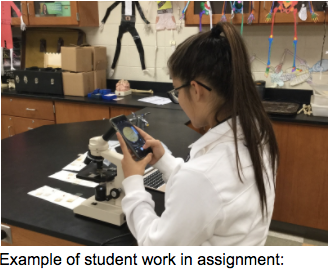 Another neat feature is that a student is actually able to magnify even further in than what is possible with the microscope by using the zoom function on the camera.